Quick and easy meatball lasagna recipe made with fresh meatballs, marinara sauce, lots of cheese. 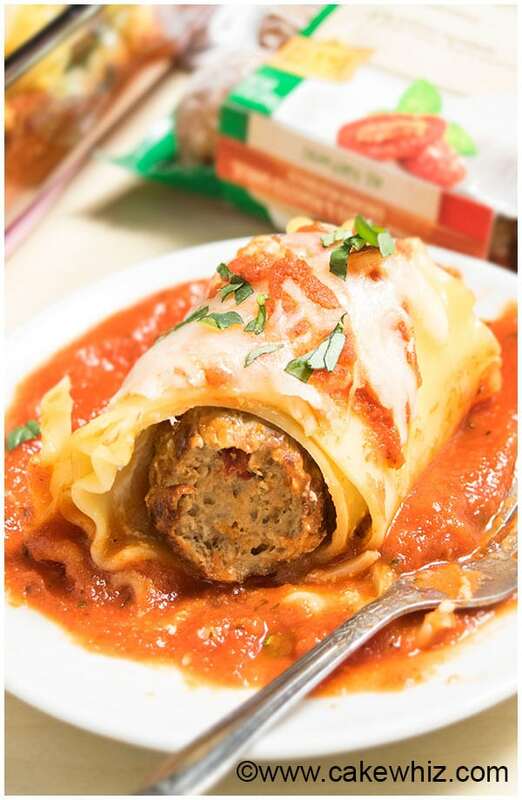 This meatball lasagna roll ups is simple 30 minute meal. 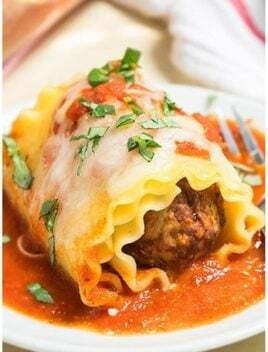 When I am in the mood for something different and more “meaty,” I like to make these meatball lasagna rolls (roll ups). 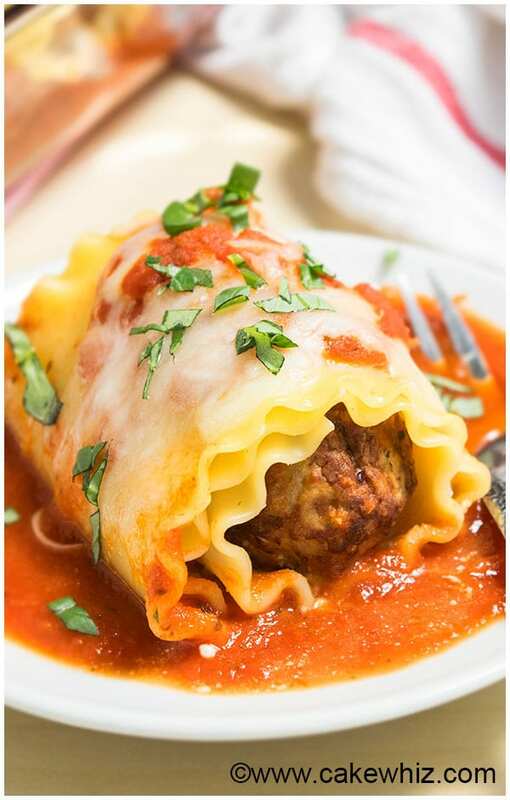 Everyone knows that I am very fond of my classic spinach lasagna rolls (roll ups) but I have served this meatball version at a few parties and I get more requests for this recipe than the other one…heheh. 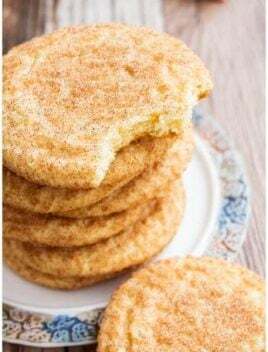 This is also a GREAT meal to make with kids and get them involved in the kitchen. My son especially enjoys the rolling part…hehe. If you make MINI meatball lasagna roll ups, you can serve them as fun and easy appetizers at parties. Make sure to boil the noodle strips until AL DENTE. There’s nothing worse than over-cooked “mushy” pasta strips. Yuck! If you prefer, you can SKIP the rolling and just make classic meatball lasagna with layers of marinara sauce, cheese and lasagna noodles. I used homemade marinara sauce but you can use store bought pasta sauce too. That would be FASTER! Instead of marinara sauce, you can also use pesto. That’s always a nice CHANGE! 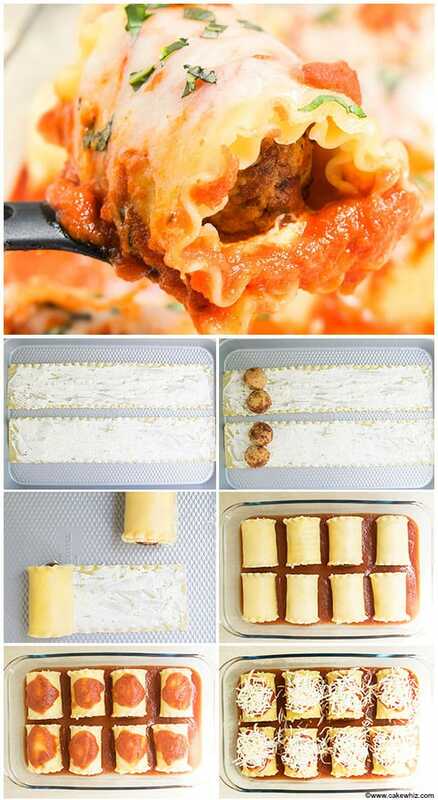 To make lasagna with meatballs and sausage, add some roughly chopped cooked sausage, along with the meatballs inside the roll ups. 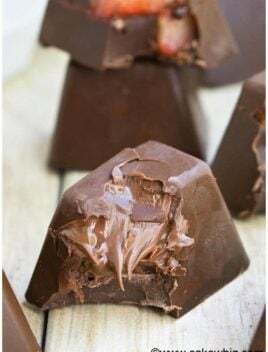 You can make the FILLING with your favorite soft cheese. My preference is cream cheese but you also use feta or ricotta. You can make HOMEMADE meatballs for lasagna but honestly, use FULLY COOKED meatballs like these Sundried Tomato & Roasted Garlic Chicken that I used from Cooked Perfect ® Fresh Meatballs. They are so convenient on busy days when you don’t have the time to make your own meatballs. Just grab this pouch, heat in the microwave and you are good to go. Super EASY! They are all natural with no artificial colors or preservatives and made from premium meats and real cheese and herbs! 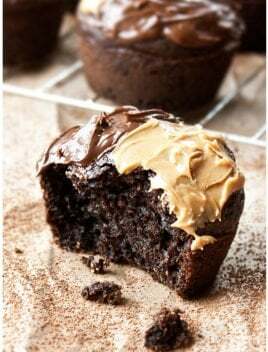 The flavor and texture is also spot-on! There are also 3 other flavors: Italian Style Beef & Pork, Korean BBQ Beef & Pork, Italian Style Chicken Meatballs with Parmesan and Mozzarella. They are currently available in the Mid-Atlantic, North East and Chicago Find Cooked Perfect Fresh Meatballs in the refrigerated meat & poultry section. Find a store near you. 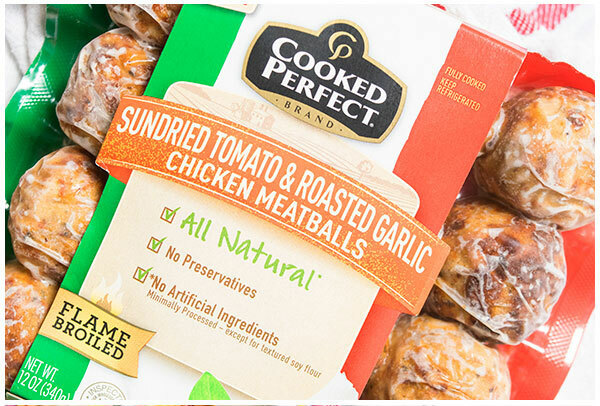 Use this coupon and Save $1.00 on Cooked Perfect Fresh Meatballs. How do you boil lasagna noodles? I highly suggest following the instructions on the box. Different brands of lasagna noodles have different boiling times. How long do you bake lasagna roll ups? 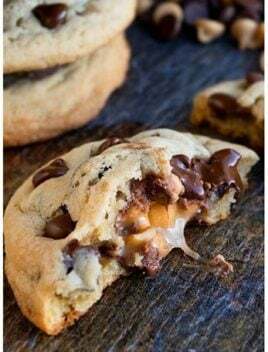 I suggest baking at 350 degrees for 20 minutes. That’s usually how long it takes for all the cheese to melt. How do I freeze lasagna rolls? 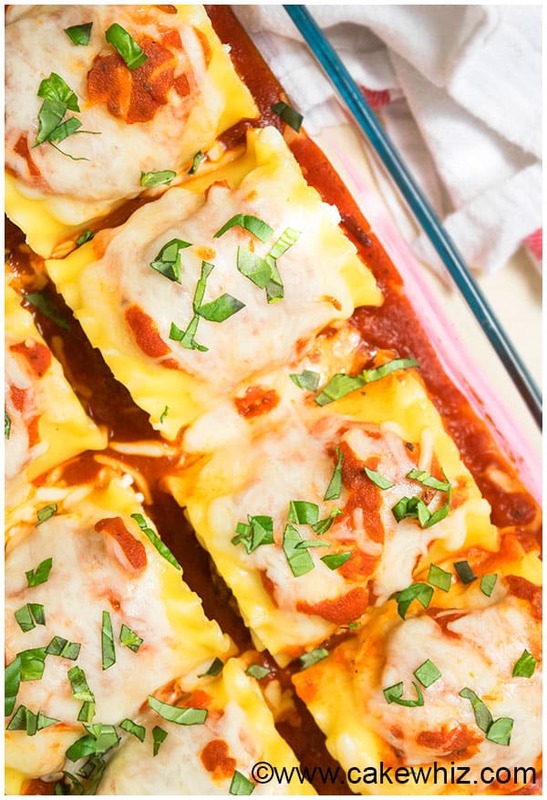 Spread the cheese filling on strips of lasagna noodles. Place two meatballs at one end of the strip and roll it tightly. 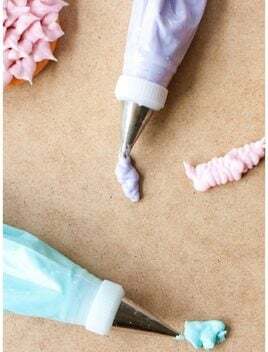 Wrap each roll with saran wrap and put them in a freezer bag. These can be stored for up to 1 month. When you are ready to make this lasagna, remove the bag from the freezer and prepare the meal, according to the instructions below. How to make meatball lasagna rolls? The process is very SIMPLE. Start off by preparing the cream cheese mixture. Spread it on boiled noodle strips. Place two meatballs at one end and roll it tightly. Arrange these roll ups in a baking dish with a thin layer of marinara sauce. Top off with more sauce and lots of cheese. Bake until cheese is bubbly and fully melted. Garnish with basil and enjoy! Quick and easy meatball lasagna recipe made with frozen meatballs, marinara sauce, lots of cheese. 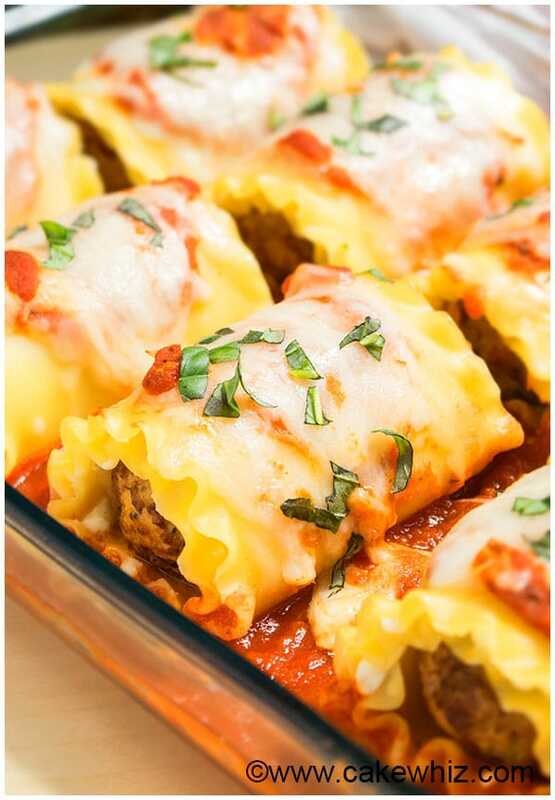 This meatball lasagna roll ups is simple 30 minute meal. Prepare the filling first => In a small bowl, add cream cheese, mozzarella cheese, salt and pepper. Mix everything together. Keep aside. Boil lasagna strips according the box instructions. Spray with oil and keep aside. Pour 3/4 cup marinara sauce in an oven safe baking dish and spread it evenly. Prepare the lasagna rolls => Spread the cheese mixture on lasagna strips. Place 2 meatballs and roll tightly. 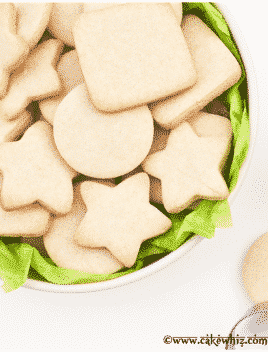 Arrange them in the baking dish. Make sure the seams are facing down. Pour remaining 1/2 cup marinara sauce on top of the rolls. Sprinkle mozzarella cheese on top of the sauce. Cover with aluminum foil and bake at 350 degrees for 20 minutes or until cheese has fully melted. Garnish with chopped basil and enjoy!